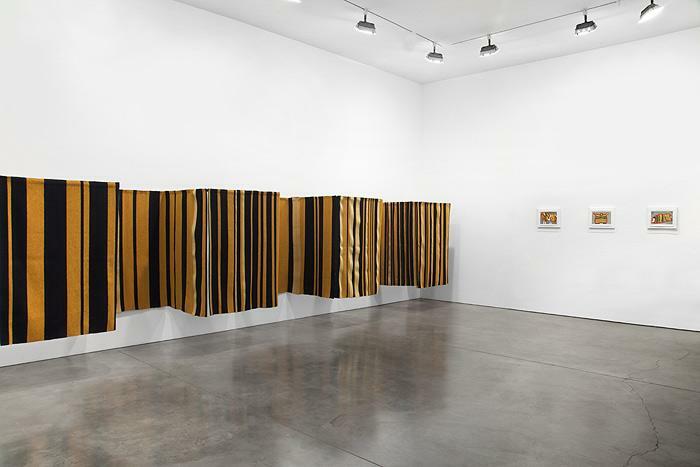 Andrea Zittel's tenth solo exhibition at Andrea Rosen Gallery is a crystalizing moment for the artist's work, and we are delighted that it is the first show to be mounted in our newly expanded main space. 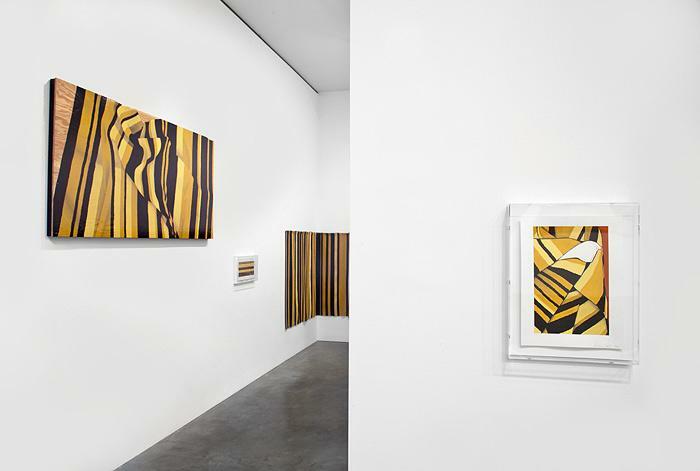 On the heels of an important solo exhibition at Magasin 3 Stockholm Konsthall, Zittel's work currently has a major presence at the Museum of Modern Art, in a room dedicated to the artist in the Contemporary Galleries on the second floor, as well as a commission by the Museum in the window of its 53rd Street entrance. As acknowledgement of her achievements and broad influence, it was recently announced that Zittel is the 2012 recipient of the prestigious Austrian Frederick and Lillian Kiesler Prize for Art and Architecture. 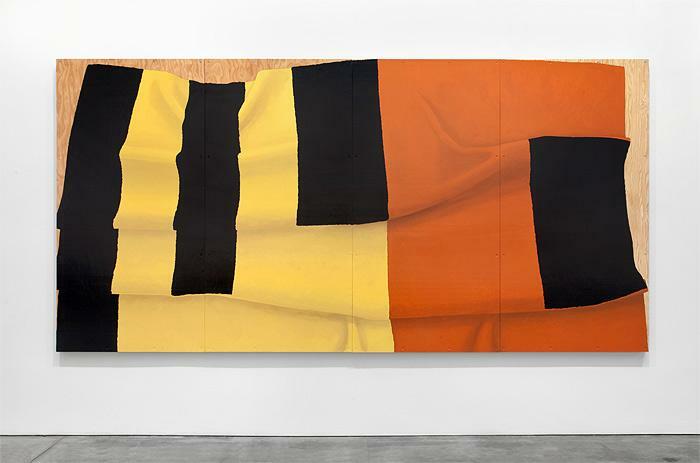 While Zittel has received substantial attention as an artist for 20 years, there exists now clear recognition both publicly and privately of her unique significance and groundwork. With this new installation at our gallery the artist has created a transcendent body of work that is both quintessentially "Zittel" and also a complete evolution, revealing the complexity and subversive relationship between our attachment to both the functional object and the art object. 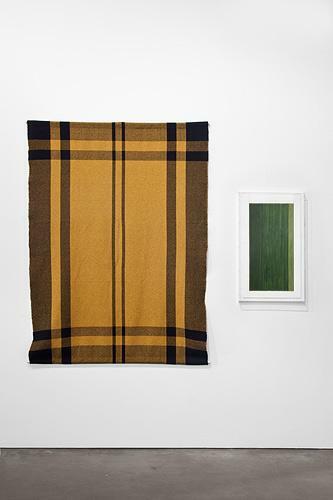 Zittel's work highlights the complicated idea that we need to find meaning and structure in our lives; our desire to imbue use objects with intentionality; and the cyclical nature of our particular ideologies or utopias. One might easily live in a Rococo house and feel meaning and attachment to the colors and motifs, which could then just as thoroughly be rejected later in favor of the austerity of a Modernist aesthetic. Zittel is known for confronting ideas, not just in theory but in practice, through all the structures of her own life – by both creating an authentic relationship to how we create meaning through constructs for living, but also by providing a long-term practice for questioning our search for utopian ideals. Zittel once said, people won't understand my work fully for at least ten years until they see the cycles of the shifts of my practice - how one utopia becomes equivalent to another. 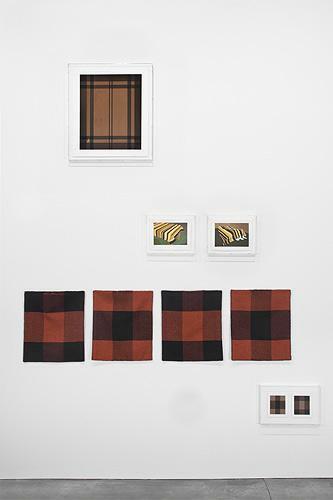 In this exhibition Zittel has removed the reference to herself; a shifting affords an unveiling of the long-term intention of her work. Instead of being fascinated by Zittel's personal story, we see our own shifting relationship between the use object and the art object; our unique need and obsession around each; our relationship to genuinely significant value structures and the shift and slippage when use objects become art objects. In what appears to be a passive, corporate Power Point presentation Zittel exposes mind-shifting ideas in which she speaks about how we psychologically ascribe entire concepts and meaning to a flat plane depending on its position. She refers to a plane that is flat or might otherwise be called a table as an "energetic accumulator." 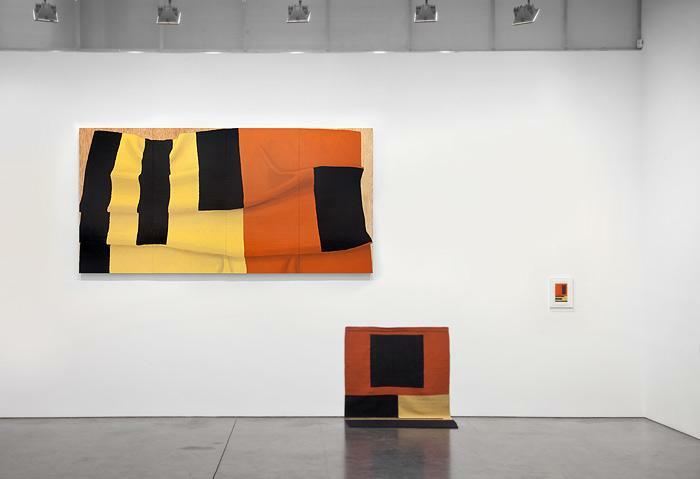 A plane that is horizontal or otherwise a painting is referred to as an "ideological resonator." These ideas unfold throughout the show. 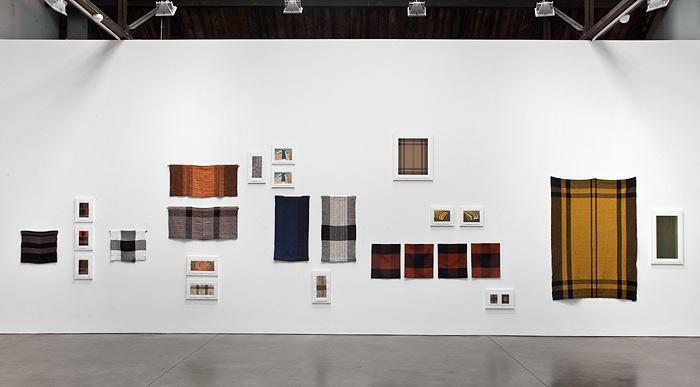 For example, a weaving depends on its placement and level of use, and altering, which not only forces an unconscious shift in perspective but also directly addresses value. 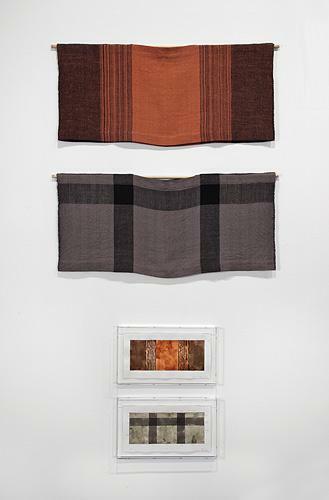 A weaving with a slit, in this case could be referred to as a poncho, where as in a more basic variant, a weaving without a slit somehow triggers a different sense of value both physically and monetarily. 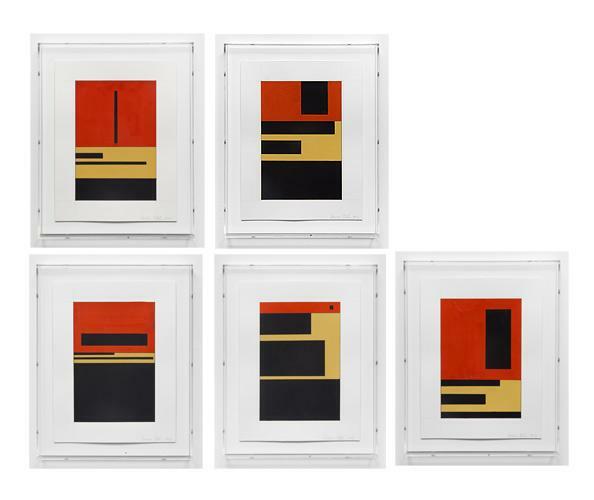 Detailed gouaches and large billboard paintings add another layer of discussion surrounding our relationship to abstract painting versus conceptual object. 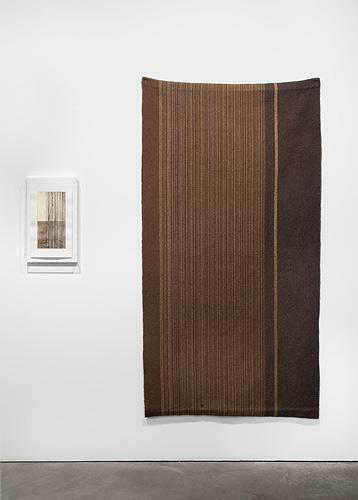 This refers to a long history of the transformation of an object to art – the way for instance a Navajo rug is a cultural artifact loved for its otherness, and then once it accumulates status, is removed from the floor and hung to become the equivalent of a painting. We think of things of value as placed on the wall. 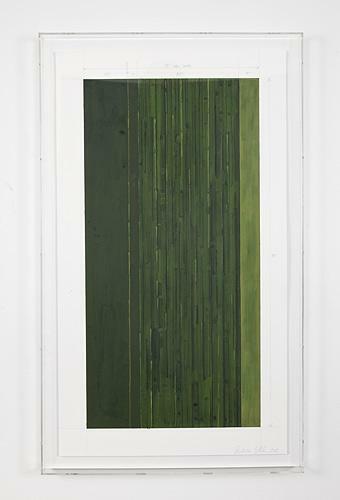 This show is full of opportunities to question methods and perceptions yet still through the filter of aesthetic awe. In the following artist statement, Zittel speaks didactically about use, placing the responsibility of experiencing the work and decoding its questions in the hands of the audience. 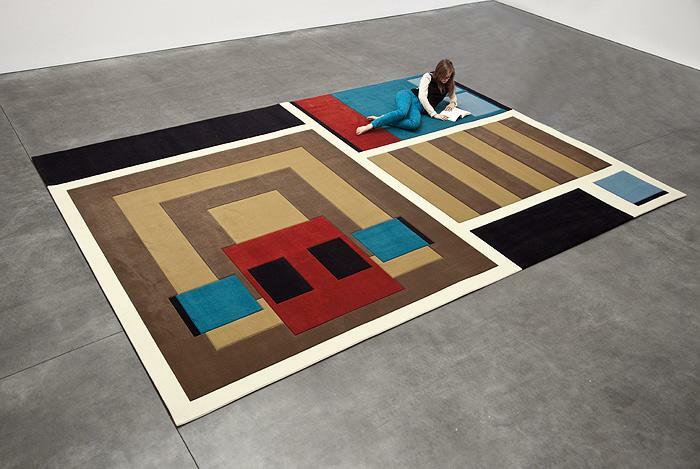 Andrea Zittel lives and works in Joshua Tree, CA. Her work can be found in notable private foundations and public institutions such as the Museum of Modern Art, New York; the Hammer Museum, Los Angeles; the Metropolitan Museum of Art, New York; Moderna Museet, Stockhom; Museum of Contemporary Art, Chicago; San Francisco Museum of Modern Art; the Solomon R. Guggenheim Museum, New York; Tate Modern, London; among many others. 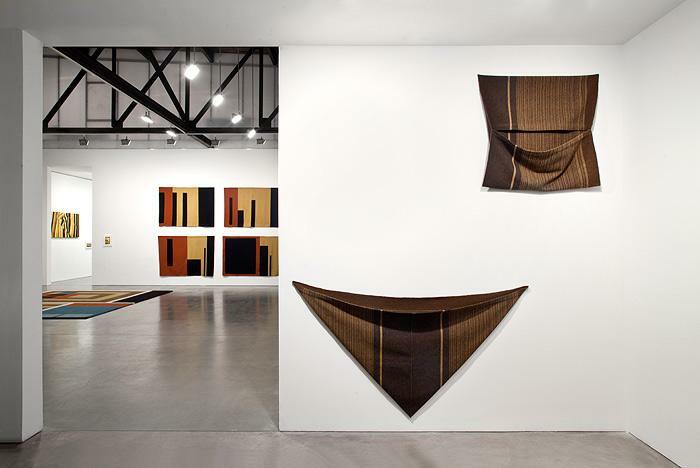 Recently, Zittel has had significant museum surveys at Magasin 3, Stockholm in 2012 and Schaulager, Basel in 2009, which followed an extensive touring exhibition "Critical Space," 2006 -2007 which traveled to the Contemporary Arts Museum Houston; New Museum, New York; Albright-Knox Art Gallery, Buffalo; Museum of Contemporary Art, Los Angeles; and Vancouver Art Gallery. Since the early 1990s I have been fascinated by various ways that we create categories, definitions and rules as a way to generate order and meaning in a seemingly chaotic and often difficult to navigate world. For instance, I find myself analyzing the subtle distinctions or social roles that separate fine art from design – while trying to understand what psychological need this separation serves. Or on a more fundamental level, I wonder how we attribute roles such as "table" or "bench" to a horizontal surface on which things can be placed, or "art" to a flat element that is hung on the wall in order to be looked at. My intention is not to collapse these categories and value systems but rather to reveal their overlooked significance and to understand our inherent psychological need to give objects personal and social relevance. A panel is a perfect example of an amorphous form that can slip between categories and social roles depending on subtle contextual shifts. A panel is a flat section of a plane that can be assigned many different functions: a doormat, a tablecloth, a bath towel, a 4x8 sheet of plywood, or a piece of printer paper. A panel can support, cover, divide or serve as a visual object. A flexible panel, such as a textile, is particularly interesting because it is in essence flat, but can transcend two dimensional space to become a dynamic three-dimensional object. I like to think of this kind of situation as a "Fluid Panel State." slippage between formal art object and useful possession. This exhibition will extend these ideas, emphasizing the tension that comes from our culture's dual-sided attraction to consumable "art" objects. On one hand we want to fill our lives with beautiful and well designed objects that we can intimately engage with in the act of day to day living, and on the other hand we yearn for objects that are charged with the authority of art history and/or ideological content. We have a fascination with artisanal art objects usurped from other cultures, because they bridge these two desires and can be imbued with a sense of meaning or cultural relevance that is parallel to that which is imparted onto fine arts. 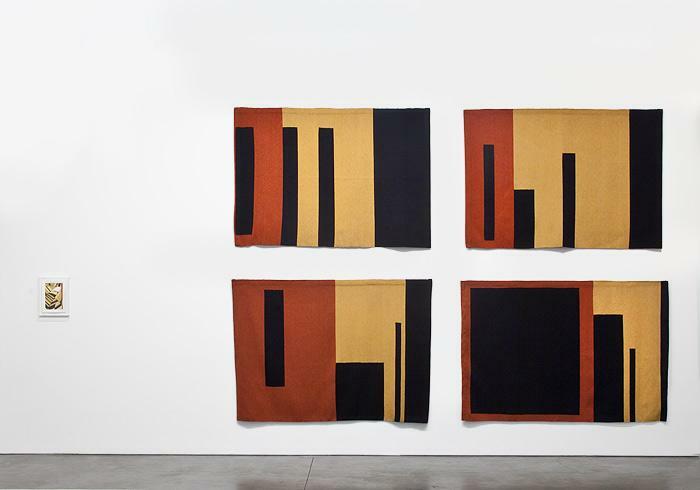 For instance, Mies van der Rohe – a maker of modern ideology - was obsessed with both Navajo rugs and paintings by Rothko, which he would hang together on the same wall. 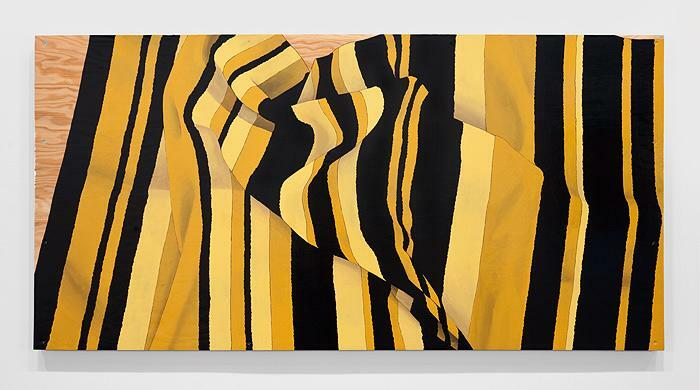 I have chosen to work at the intersection between textiles and painting as both are formal, tactile objects that are embedded with a conceptual language that comes from their social history and technical act of making. In this case I have imposed my own set of rules (presented as a series of instructions) to the weavers, who are a diverse, highly skilled group of artists and artisans from all over the country. The end result reflects duration as well as technical and subjective decision-making processes. 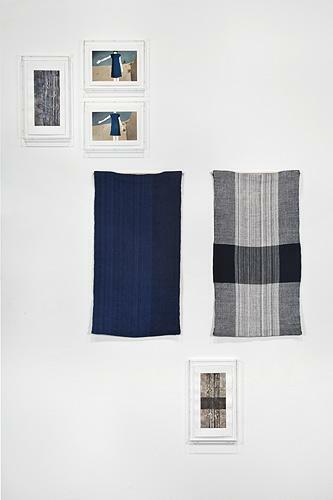 For example, a series of striped panels have been generated by asking the weavers to switch thread colors with each new weaving session – marking the beginning of each day with a strip of light yellow. 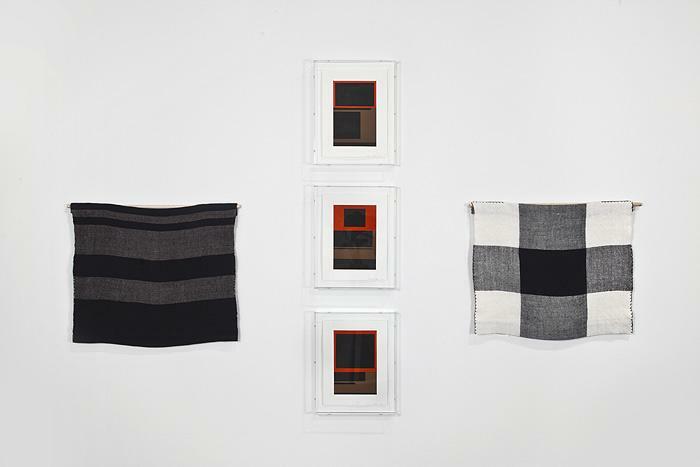 Or, for a series of geometric panels, the weavers are simply given a set of instructions, similar to those used by Sol LeWitt to generate wall drawings – only the weavings allow for a predetermined range of subjective decisions. My goal is to make a work that is simultaneously a highly rendered artisan object, conceptual art, and functional object. the dimensions of the body, so there is no waste or fabric left unused. In the exhibition are also new works from my ongoing series of "Prototypes of Billboards," "A-Z Studies for Furniture," and diaristic gouaches. I have always been interested in the crossover between fine art and commercial art. Early on, I started to paint in a more commercial and illustrative manner, which felt completely liberating, as I was no longer struggling with the ideological weight of representation in fine art. Because we already understand advertisements to serve a function of persuasion, they already read as a potential "fraud," which somehow makes them feel more truthful since their role as propaganda is so transparent. 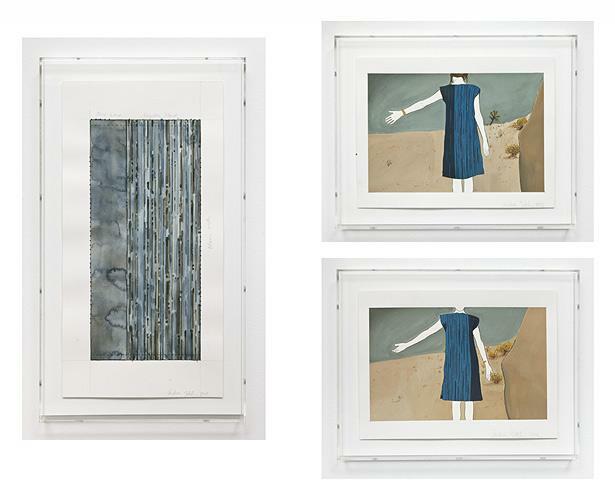 All of these new works are representations of the "panels" in themselves. 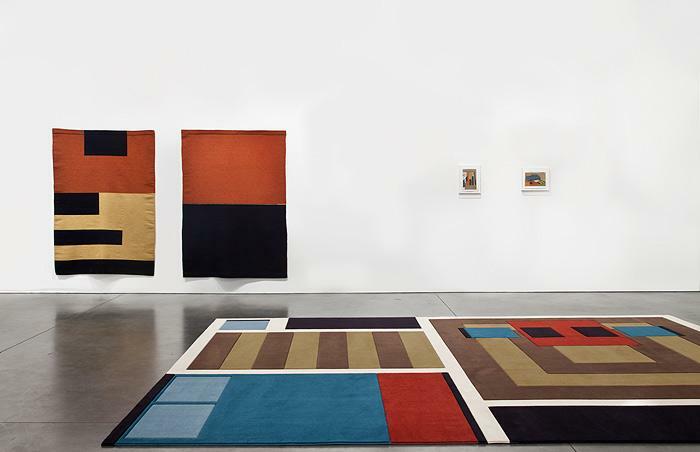 "A-Z Carpet Furniture" is another work that highlights the slippage between represented space and literal space. It hovers between being a representation of something (it can hang on the wall or lay on the floor) and the actual thing itself (it is meant to be used just like any furniture). The newest and largest work of the series is "A-Z Carpet Furniture: Cabin," which is a panel that creates a functional space which fits exactly into 12' x 16' cabin that I one day hope to acquire, adjacent to my current home A-Z West. I often fantasize about one day retreating to this cabin with nothing more then my carpet furniture, a camp stove and many stacks of books.